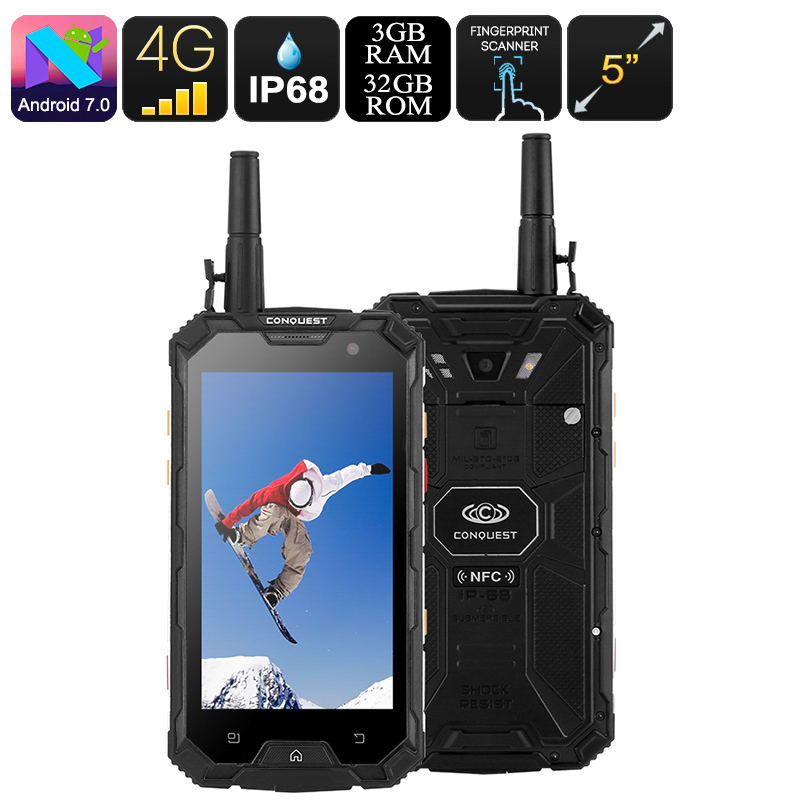 Successfully Added Conquest S8 32GB Rugged Smartphone - Octa Core CPU, 3GB RAM, Android 7, 4G, Walkie Talkie, NFC, OTG (Black) to your Shopping Cart. This is the 32GB version of the hugely popular Conquest S8 2017. It has a toughened outer that brings it an IP68 rating and with Corning Gorilla Glass 4 protecting the screen this phone is ready to take on the harshest environments. If you work in construction or outdoors then you need a phone that is at home in the elements and the Conquest S8 is able to do that. It is protected from water and dirt ingress as well as from drops. With access to 2G, 3G, and 4G cellular networks you get great connectivity from this rugged phone. Even if there is no network available you can still communicate with the phones walkie-talkie function. The phone boats a huge 6000mAh battery so can run for days without needing to be recharged. Protected under that toughened shell is a powerful Octa-Core MTK6753 processor clocked at 1.5Ghz. This runs alongside 3GB of RAM and together they bring a solid and speedy performance. For storage of all your media apps and games, the phone has 32GB of onboard storage space. Should you require more you can use a micro SD card to extend the memory by up to 64GB. The should be more than enough for even the heaviest of phone users. The Conquest S8 has a 5-Inch IPS display with 720P resolutions. This makes watching films, playing games or surfing the web enjoyable as it shows text and graphics in fantastic detail. Along with the 4G connectivity, you can now stream HD video and watch it in its native resolution so you have a great viewing experience. The Conquest S8 32GB version comes with a 12 months warranty, brought to you by the leader in electronic devices as well as wholesale electronic gadgets..